The Glass Defender Series consists of a variety of invisible coatings for glass that protect the surface from a wide variety of damaging elements. In addition, Glass Defender coatings help to resist scratching on glass surfaces. These products help to prevent the development of stains caused by minerals including silicates, magnesium, calcium, lime, rust and salts. These protective coatings will also keep water from penetrating the glass surface, and thus eliminate damage caused by ion exchange, oxidation, water erosion, etching and stage 1 and 2 corrosion. They also help protect against environmental damage, including high mineral content tap or well water, exhaust fumes, chemicals, acid rain, ice, everyday grime and buildup, and mineral dust in the air. 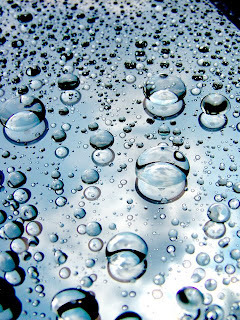 When water comes into contact with treated surfaces, it beads and runs down the glass, partially cleaning the surface. This helps to keep windows cleaner longer, and aides in deionized water window cleaning. The materials in the Glass Defender Series are extremely durable, and can withstand high levels of UV rays and temperatures between -50°F and 500°F. To protect glass for 10-20 years, use Glass Defender® HD. To protect glass for 5-10 years, useGlass Defender® MD. To ensure adhesion of Glass Defender HD or MD, and extend the lifespan of the protective coating, use Glass Defender® Primer prior to the application of the Glass Defender product. Seen microscopically, the surface of glass is extremely porous, and contains many valleys in which minerals form deep roots in the glass surface. The Glass Defender Series fills in these crevices creating a smooth, protected, plastic-like surface. The series reacts with minerals in the glass to form a polymeric barrier against environmental contaminants. Glass Defender HD (Heavy Duty) is a proprietary blend of high-performance, partially fluorinated polymers. It provides a coating which helps to protect glass surfaces for 10 to 20 years. This product is recommended for surfaces that are likely to develop damage or stains due to the use of oily surfactant systems and harsh chemicals found in improper window cleaning detergents and surrounding stone sealers. Glass Defender HD is the only product that will help to protect glass from stains resulting from adjacent oil-laden stone, such as precast that has been sealed with inferior organic water repellents (i.e. 40% silane). Silane helps protect stone from within, but does not effectively protect the stone’s surface. We recommend using Glass Defender HD when oil-based window cleaning detergents are used to maintain the glass. Glass Defender MD (Medium Duty) is a proprietary blend of high-performance, partially fluorinated polymers. It provides a coating which helps to protect glass surfaces for 5 to 10 years against many types of stains, except oil stains or harsh chemical damage. Glass Defender Primer extends the performance life of Glass Defender MD from 5 to 10 years, and Glass Defender HD from 10 to 20 years. Applying this product is optional. The picture above is of a glass restoration test area. To the right of the square is protected with Glass Defender.